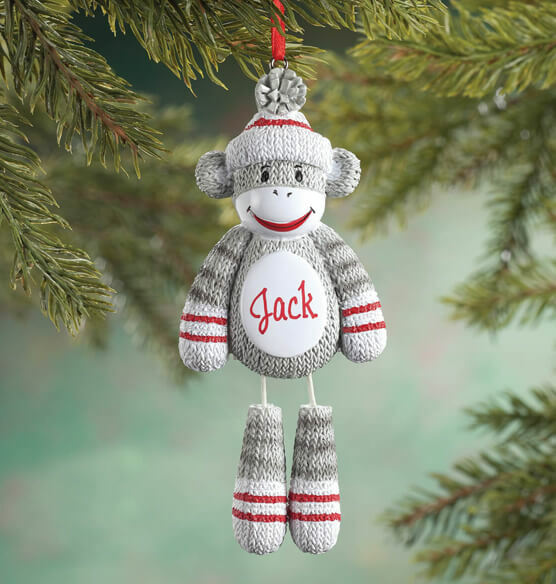 Our personalized sock monkey ornament knocks the socks off ordinary Christmas ornaments ... personalized for a keepsake gift! Inspired by nostalgic stuffed toys (but designed in sturdy resin), he features stitch-look finish, red-heel stripes, classic cap, big red smile and cute, dangling legs. We'll add one special name to his shiny white belly, creating a fun gift for kids of all ages. Specify name; limit 1 line, 7 letters/spaces. Resin. 5 1/2" high. BEST ANSWER: Thank you for your question. The sock monkey and can personalized with a boy or girl name. We hope this information will be of help to you.